A Greyhound bus driver got off her bus in Charleston, Missouri and walked away. 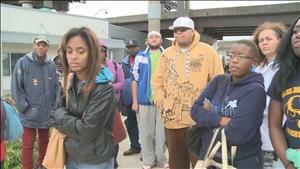 She left the passengers stranded for 8 hours before another driver took them to St. Louis. Passengers say it was a travel nightmare. A Greyhound bus bound for St. Louis was stranded all night at a truck-stop after the driver got off the bus and never came back. Passengers say the first problem on the trip happened in Sikeston. They say the driver kicked a passenger, 65, off the bus in Sikeston because she didn’t like what he was saying. The bus continued North on I-55. Around Cape Girardeau, the driver pulled over and stopped the bus on the side of the road. She told passengers she was leaving. She locked the door and went outside to wait for a ride. Passengers called 911 and police ordered the driver back on the bus. But instead of heading north to St. Louis, she turned the bus around. She got off the interstate in Charleston, MO and got off the bus for good. The passengers were stranded at a truck-stop. They called Greyhound for help, but it took hours to get a new driver. They ended up spending the night on the bus. They finally arrived in St. Louis just before noon, nearly 12 hours after they were scheduled to arrive.